Buy 1 for $9.96Buy 2 / Save $0.53!Buy 3 / Save $1.99! Pennyroyal has carminative, diaphoretic, and emmenagogic properties. It has been used to settle upset stomachs and nervous headaches. In recent years, pennyroyal tea has become popular to promote menstrual flow, support cramps, and in some instances to induce abortion. However, sad consequences have resulted from using pennyroyal oil for such purposes. In 1978 a Denver woman died after ingesting a one-ounce dose of pennyroyal oil reportedly to induce abortion - though she apparently wasn't pregnant. 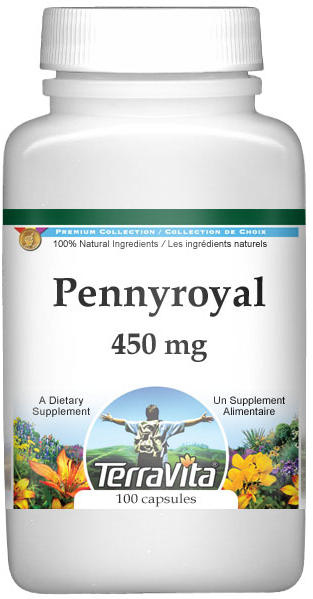 A rash of newspaper articles condemning pennyroyal herb followed. Speaking at the third International Herb Symposium held in 1979 at the University of California, Santa Cruz, Dr. Norman Farnsworth of the University of Illinois, Chicago, put the case in proper perspective. You would have to ingest about seventy-five gallons of strong pennyroyal tea (within a short time) to equal the effect of a one-ounce dose of pennyroyal oil. He also noted that almost any plant-derived essential oil in a one-ounce dose could be fatal. European and pennyroyal are interchangeable. Pulegone is the chief constituent of their oils. Both can be used as an insect repellant. European pennyroyal, Mentha pulegium, is a perennial member of the same genus to which peppermint and spearmint belong. It is native to Europe and west Asia, grows to a foot tall, and has rather a sprawling habit. The opposite leaves are smooth or slightly hairy, oval or roundish, about an inch long, with small or no teeth. Tight whorls of small irregular lilac flowers bloom from July to August. It spreads by underground runners. M. pulegium var. gilbraltarica has fuzzy white leaves. M. pulegium has become naturalized in a wide variety of California plant communities. Hedeoma pulegioides, pennyroyal, is an annual plant of open woods and fields from eastern North America. It grows to fifteen inches in height with leaves three-fourths inch wide and about one inch long, resembling those of M. pulegium. The one-fourth inch long bluish-purple flowers appear in summer in whorls around upper leaf axils. H. pulegioides must be grown from seed sown in the spring or fall. M. pulegium is best propagated by dividing root runners in spring or early September and by summer stem cuttings. Space plants eight to twelve inches apart. Pennyroyal needs fairly rich, sandy loam, with a good supply of moisture and a pH range from 5.5 to 8. Full sun or partial shade are tolerable. European pennyroyal must have room to spread. After the plant flowers, it shoots out root runners from the crown. A pennyroyal lawn needs only occasional mowing. North of Pennsylvania, pennyroyal will need a winter mulch.